Summer is finally here in the central valley of Oregon. The fruit trees are getting close to ripening. The cherries came and went mostly to the birds. Now the apples are beginning to drop and although still tart to my taste, the alpacas are enjoying them. Soon I will have enough that drop each morning to fill up buckets and I can take them out to the pastures. I don't have irrigation so the grass is getting dry and less appetizing to the alpacas for grazing. So taking out buckets of apples is such a treat for them. By summer's end or at least end of apple season, even the alpacas that haven't been sure about liking apples are enjoying them. Everyone has sticky lips. I take those buckets and toss them all around. 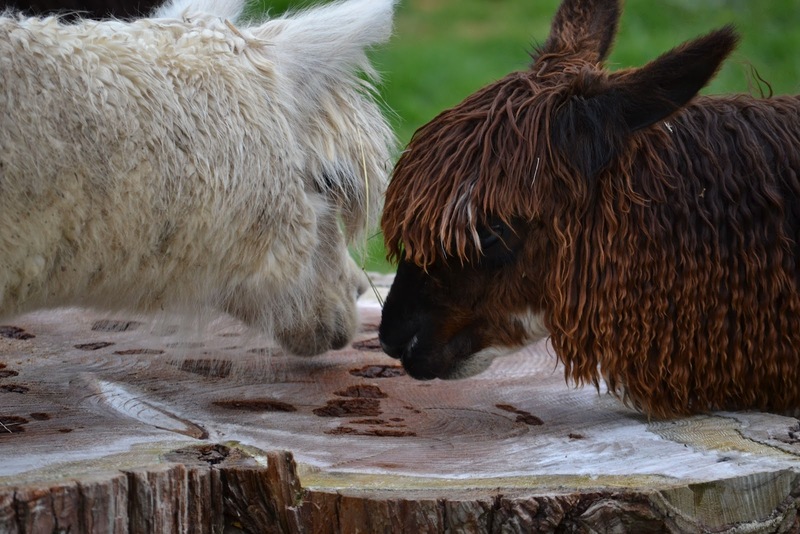 Alpacas being foragers, it is more interesting for them to hunt for their apples than me just handing them out. It's apple treasure hunts. It sure is cute to watch them run after the apples like we were playing fetch only they don't bring them back for me to toss again. Some are so clever. They use their feet to hold the apple still so they can get good bites while others have the apples squirting about as they try and get those first bites. Alpacas get bored like the rest of us. Being able to graze and change their environments occasionally stimulates their interest. I see their boredom more in summer with the poorer grazing available to them. The boredom is indicated with them chewing on fencing more and of course the consumption of hay goes up too. Once in awhile if I don't get out to mow the fields for a bit and it gets longer, I make paths. I get bored mowing and it is fun for me to change what I'm doing than going back and forth. Sometimes they notice and the younger ones especially enjoy the paths and play their cria races in and out of them. For a few days, it gives them entertainment at least. And then, the apple treasure hunts give them a little bit of more stimulation. I am forever looking for different things to do with them especially in the summer. Doing clicker training with the alpacas is another cure for boredom. Summer is a good time to teach them a new behavior or trick. It stimulates their brain, it is different and fun. It is also a good break for me. With the long days of summer and all the work always needing to be done, I have found it important for me to take time to stop and enjoy the alpacas too. So tossing apples and spending a few minutes to clicker train the alpacas is good for all of us. Being a little playful is good for the soul.